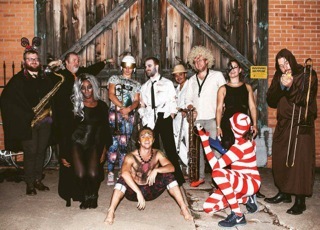 Count Tutu is a fun-fun-fun 11-piece funking horn outfit from Tulsa led by Nathan Wright and Mike Cameron. Its high energy dance music draws from Fela Kuti, James Brown and Rage Against the Machine. Since their first show in July 2015, Count Tutu has packed houses in Tulsa, booked the Caribbean Sea Jazz Festival in Aruba, and played the Tulsa Roots Music GLOBAL BASH with Fishbone and the Dirty Dozen Brass Band. Big thanks to Riverfield Country Day School for sponsoring the day’s activities.